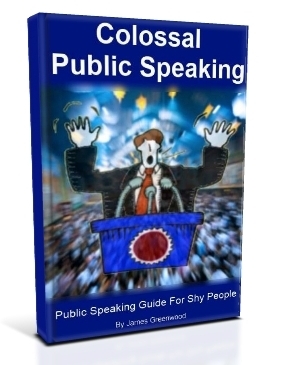 I've just finished reading James Greenward's ebook, "Colossal Public Speaking: A Public Speaking Guide for Shy People," and I enjoyed it so I wanted to tell you a bit about it. This book is not really about how to create a presentation (though there are some pointers for how to structure your story); instead, it focuses more on how to prepare yourself -- both mentally and physically -- to maximize your chances of delivering a compelling message, while overcoming fear, anxiety, and doubt. Greenward's guide is a "from the trenches" perspective on how to overcome some of the challenges of public speaking and presenting, particularly the aspects in which we tend to become our own worst enemies. In this ebook, you'll find practical advice for how to become more comfortable in front of crowds, and tips and tricks to get some practice in before you actually stand up in front of the crowd. I use a few of the techniques he describes (for example, "presenting" to myself during my commute), but I also learned a few new techniques from the book that I'm going to try. One of the sections discusses how to get rid of stage fright (there's no silver bullet, but the tips he shares will help), and how to leverage your own personality and create a higher-impact presentation. He also talks about how to get rid of things might be distracting, both in your voice and in your appearance - there is some good advice here, for sure. One thing in this book was a bit different from other presentation books I've read: Greenward's treatment of the Q&A session and how to prepare for success. In particular, he discusses how to deal with adversarial audience members and how to deal with uncomfortable (and even unfair) questions. If you consider yourself to be a shy or inexperienced public speaker, have a look at Greenward's site, where you'll find out more about this ebook as well as an ordering page.